Zune HD: Finally Decent Looking But No HD Screen! There’s been loads of ‘leaks’ of the next generation of the less-than-popular Microsoft portable media player, the Zune. Named Zune HD, it’s a heck of a lot better looking than all of the previous Zunes, as does the interface. Gone is the round button, opting instead for a full touch screen. HD Video, allowing the viewing of 720p videos, which can also be shown on a HDTV, via the Dock at an additional cost. Don’t get too excited, the screen on the ZuneHD isn’t 720p resolution itself, as the screen is actually 480 x 272, but it does downscale them. HD Radio is the slightly surprising HD, giving free access to high quality audio channels (if you happen to be in a country with HD radio) and an interesting idea of allowing the tagging of songs played on the radio, for later purchase. As you would expect, there will be a Web browser (IE) that will utilise the build in WiFi. 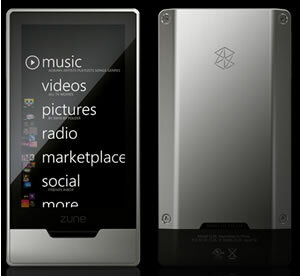 The first Zune was covered by us back in July 2006, when Microsoft thought that denying its existance would make people interested in buying it, when released in November 2006. Zune 2.0, released at Christmas 2007 didn’t do much better. Of course it doesn’t have a 3 inch 1080p screen, that would be absurd with each pixel about the size of an atom.